Sunday August 1st 1920 It was very late when we got up. Edith went to church. I read a book during the day being on porch. 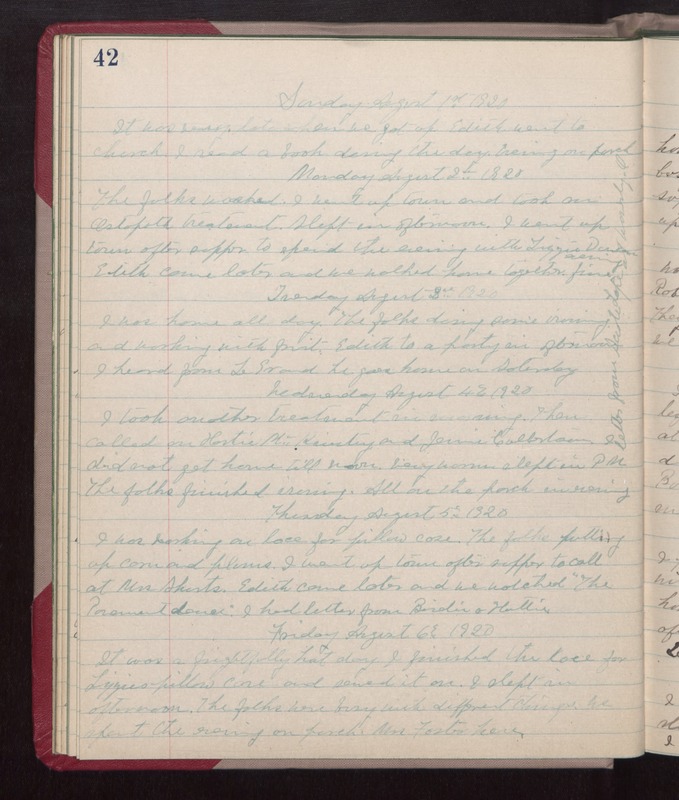 Monday August 2nd 1920 The folks washed. I went up town and took an Osteopath treatment. Slept in afternoon. I went up town after supper to spend the evening with Lizzie Duncan. Edith came later and we walked home together. Fine evening. Tuesday August 3rd 1920 I was home all day. The folks doing some ironing and working with fruit. Edith to a party in afternoon. I heard from LeGrand. He goes home on Saturday. Wednesday August 4th 1920 I took another treatment in morning. Then called on Hortie McKinstry and Jennie Culbertson. I did not get home till noon. Very warm. Slept in PM. Letter from Scite Lape at [Waverly? ], O. The folks finished ironing. All on the porch in evening. Thursday August 5th 1920 I was working on lace for pillow case. The folks putting up corn and plums. I went up town after supper to call at Mrs Shurts. Edith came later and we watched "The Paramount Dance." I had letter from Birdie & Hattie. Friday August 6th 1920 It was a frightfully hot day. I finished the lace for Lizzies pillow case and sewed it on. I slept in afternoon. The folks were busy with different things. We spent the evening on porch. Mrs Foster here.